When my husband, daughter, and I travel during the holidays, it's almost always "home" to Vermont to visit—and stay with—my family. Although that's a lovely thing in many respects, it’s not so great for my workout routine. Not only do I not have the option of heading to the hotel pool or gym, but there's also so much going on that there’s rarely time to fit in a full-scale sweat session (sound familiar?). But I also know that with all the can't-pass-'em-up homemade treats (my mom's maple dumplings, my sister's butterscotch cookies, my friend Marget's fudge sauce) vying for belly space—and, yes, the occasional stressful moment that comes from having a dozen or so independent-minded adults (plus eight kids) crammed into a single room—exercise is crucial to both my mental well-being and my waistline. The first thing I do when I get up in the morning is 10 minutes of sun salutations. They get my blood flowing, involve some serious strength (hello, chaturanga! ), and get the tiniest bit of sweat going. I also make sure to tell my early-rising mom that she'll find me down-dogging in her living room every morning before breakfast. (I don't know about you, but when someone expects me to do something, I'm more inclined to actually do it.) And, of course, I do them in my pajamas—who wants to get dressed before breakfast when you're on vacation? I set a daily step goal, then wear my activity monitor and challenge myself to meet that target each day. To help reach it, I take at least one walk during daylight hours. I'm rarely alone—my mom and her dog, Abby, come along, or my sister pairs up with me for some girl talk, or I pull my daughter, Zoe, behind me in her sled. Then, after Zoe goes to bed in the evenings, my husband, Eric, and I bundle up and head back out for a peaceful stroll to view the holiday lights. It's become a tradition for us, and I love it. 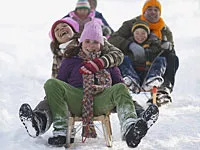 As a family, we try to turn at least some of our gatherings into active outings—cross-country skiing at the local country club, ice skating at the indoor rink near my mom's house, sledding down the awesome hill near my sister’s house, or caroling around the neighborhood. That way, we get to hang out and burn some calories at the same time.